I always ponder the quote, “there are no rest stops on the road of life” for its core truth, but thankfully when traveling across the barren landscape of Namibia rest stops, although limited, do exist. Yet, a stop in Solitaire provides more than just a chance to gas up, stretch the legs, hit the bathroom or get the latest travel news. 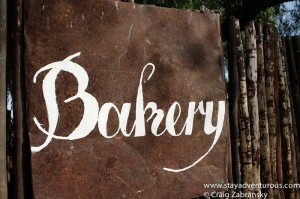 A bakery bakes delicious cookies, sweets, and the best apple pie in town. 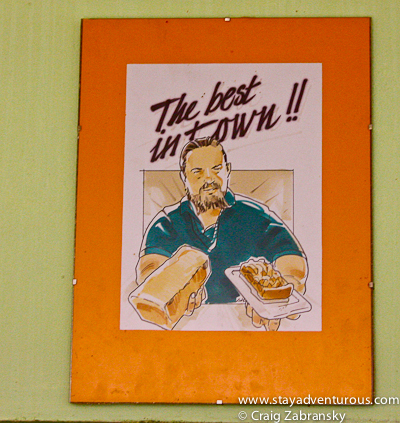 Well, it’s an easy claim since it’s the only bakery in town, but the praise from our guide and other visitors intrigued. 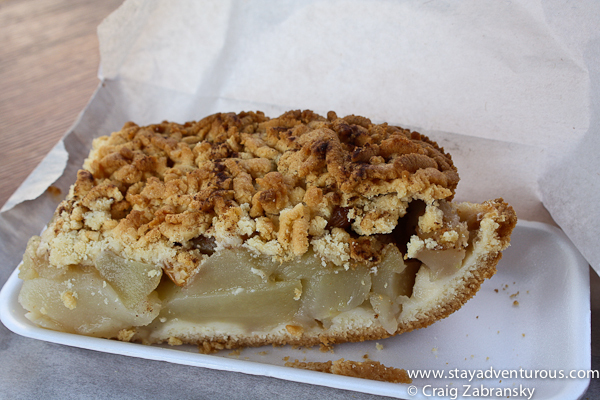 Then we were told this is the best apple pie in Namibia; the best in Africa. Then the trump card – it’s better than America. Wait, what? As Namibian as apple pie? Ok, time to try a slice. I got on line and ordered a piece to share. line up for the baked goods.. Waiting to order, I attempted to figure out the logistics. Where are the apples grown? How do they even arrive at this remote place? Our next stop was the Sossusvlei Lodge and the Red Sand Dunes of Sossusvlei, we were remote to say the least. I had no answers, so I stopped thinking about it. Sometimes experiences defy logic, plus this moment was a test for my sense of taste and logic was not required. I received my slice and settled at a table in the outside courtyard. Whiffs of fresh baked goods filled up the old factory in the calm, comfortable climate. Within seconds, my fork broke through the crust and scooped up my first bite. Good. Wait. Really good. Another. 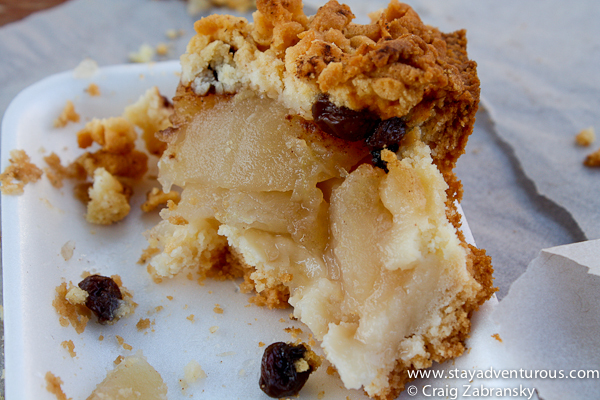 Not too sweet, plenty of apples, some soft crumbs, and some raisins made a good pie. Really good. Really, really good. To be honest, I am not sure I ever did have a better piece of apple pie. It’s definitely top 5 (but don’t ask me the other four). Today, I can verify the claim, it’s definitely the best in town, the best piece of pie in Solitaire. It always amazes me, sometimes you just never know what you’ll find across the globe. this post is part of the culture through cuisine series and part of my Namibia Adventure series. 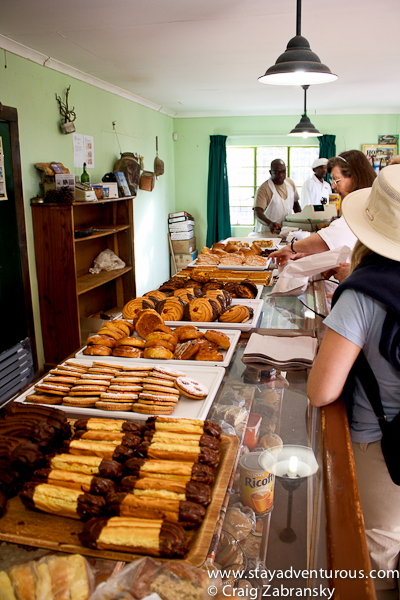 Wait on line in a bakery in Solitaire, Namibia? Who would ever imagine it. But then again it must have been the only bakery for many, many miles. Great apple pie. Wonderful place to visit. @Kat, thanks, glad you like the title, and it was a surprisingly tasty piece of apple pie. @rad, it was the only anything for miles and miles. Oh, that looks delicious! How was the crust? That’s the selling point for me. Follow it up with a scoop of vanilla ice cream and we’re in business. the crust wasn’t strong in texture or taste and was very thin… I enjoy thin crust. omg! so yummy! I had some when I traveled through Namibia on my tour with Nomad Adventure Tours. I am starving and would kill for some apple pie. There is something about apple pie, that makes it even more special than any type of pie. I love the different interpretations that it has – it can be so different in America, France (OMG! ), Austria and.. Namibia, why not! I will search for some more and report back! France, really? I never knew. ahhh…so true. you’d think you might find the best apple pie in America because, well, it’s part of a tv jingle 😉 gorgeous photos and description that make me want to reach into the screen a sneak a bite! i appreciate your words about the photos….actually they were purchased by a magazine. I think that might make this apple pie my absolute favorite now Can you see my smile? This post takes me right back. Unfortunately, I was feeling a bit under the weather here, after hitting my head hard on the roof of our truck when we hit a bump. I do remember the chicken/mayo pie I had, and the apple pie too. Need to go back! !